There is very little about galactosemia that allows our family to act proactively. I almost entirely feel like we are living life on the defensive, constantly combatting anything that might encroach on Oliver’s ability to live a happy, healthy life. On the defensive about what he eats and what the ingredients are. On the defensive against (mostly) well-meaning adults who offer him foods and treats without checking with mom and dad first (think: grocery store sample-giver-outers and Great-Aunt Bertha who thinks every kid needs a cupcake in his life). On the defensive against companies who change ingredients in their products with little to no fanfare or acknowledgment just as we’ve gotten comfortable and added them to our regular rotation. And on the defensive against other young children who don’t understand that, no, Oliver can’t have that cookie you want to share with him (or suppress the urge to lay hands on them when they teasingly wave an ice cream cone in front of him to be “funny”). Really his visits to all of the doctors and dietitians are more observational than anything else and I would say do not even rise to the level of defense, never mind offense. If we are being honest with ourselves, we (meaning John and myself) along with the medical professionals, are really just monitoring all of his systems, his numbers, and any signs of what developmental or medical hurdles might be on the horizon. Even if we provide Oliver with what we think is a perfectly restricted diet, that is absolutely no guarantee he will not still have some difficulties in the future and there is nothing we can do to prevent them. Individuals with galactosemia may still develop neurological conditions or movement disorders or speech/language issues or learning disabilities or any number of the other complications that have been linked to galactosemia. All we can do is watch, wait, and, if we are lucky, implement appropriate interventions that may or may not help. I write all of this so someone on the outside of our situation might be able to understand why we would contact our local agency responsible for early intervention services when Oliver was only seven months old and why we would have him evaluated before he even turned nine months old. Despite not showing any development delays at that point, we jumped at any opportunity to be proactive given the circumstances. We are fortunate to live in a county in Pennsylvania that offers free early intervention evaluations and, if your child qualifies, free intervention services. This is offered at the county-level from birth to age three, and then by the local Intermediate Unit, which provides certain services, including interventions, to area schools, until the age of five. These early intervention programs bring together parents, practitioners, and others to help provide support and services to families with disabilities and developmental delays. Children are evaluated for physical development, including vision and hearing, cognitive development, communication, social and emotional development, and adaptive development, which includes the ability to complete everyday tasks of living, like getting dressed or feeding oneself. So our little Ollie was evaluated once when he was not quite nine months old and then again last month at 19 months. At his first evaluation, he scored within normal range under every category and the evaluator provided us with further information on what we could keep an eye out for in the future and also simple ways we could aid in Oliver’s development, particularly with learning language. At that point, we were offered the option of entering into an early intervention tracking program where the county would follow-up periodically with us to see if more evaluation would be needed and we would have the ability to contact the coordinator with any questions or issues as they come. Again, in the name of proactivity, we opted to remain in the tracking program. 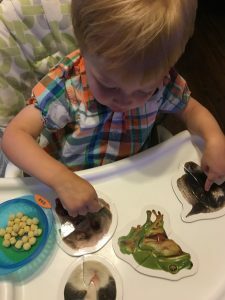 Prior to Oliver’s most recent evaluation, John and I were becoming increasingly concerned about his development, specifically his language skills. The standards for what is considered normal for an 18 or 19 month old vary depending on the source you reference. According to the Centers for Disease Control, an 18 month old should be able to say “several single words.” Compare that to a source like, What to Expect the Second Year, which is more specific, stating that most toddlers 15 to 18 months old can say “10-plus words…[s]ome gifted gabbers may be able to use 20 to 30 words” and warns of a language explosion from 18 to 24 months, where children have anywhere from 50 to 200 words by age two (p. 258). Such a range of what is considered “normal” can make it nearly impossible for a parent to objectively evaluate how their child’s speech and language skills are progressing, particularly if those parents are already hyper-aware of the possibility there could be issues in store for their child. We were especially concerned that he was only independently verbalizing those six words and did not seem to be moving forward at all. For example, if we walked by a flower or an apple, he would point and say the word without prompting. Try as we might, we just could not seem to expand his independent vocabulary. Just to give you an idea of what a difference three weeks can make, by the time we actually met with the speech therapist for his evaluation, the list of words he was using on his own had nearly doubled. That is a huge stride in a short period of time! Predictable movements/sounds such as 1-2-3 Go! Allow him to finish it. I would be lying if I said our minds are set completely at ease after this evaluation. Sure, it helps, but that relief will begin to give way to doubt soon enough. For now, we are going to continue to work with Oliver as much as we can, while still making the learning process fun and with as little stress for him as possible. Our vow continues to be to view every word, every physical milestone, and every new “first” as cause to celebrate and rejoice! Some certainly may be hard-won, but those victories will be all the sweeter in the end. Subscribe to Oliver's Rare Adventure!